I just knew something was off. After experiencing a sudden weight loss and some abnormalities in my monthly cycle I decided to go to my family physician to get some answers. At the visit, it was suggested that I follow up with a specialist. This lead to many more appointments and doctors visits, all leaving me with the same questions and still no answers. It was then that I decided to go to Woman’s Hospital. 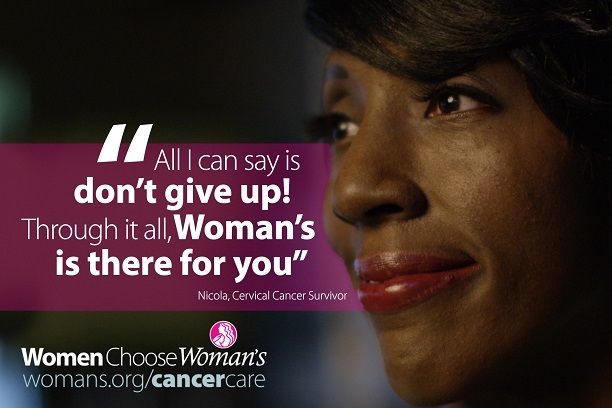 Following a routine exam and a few tests, I was diagnosed with Cervical Cancer. Upon hearing those words, I became very scared and anxious, not only for me and my well-being, but also for my family. The doctors at Woman’s quickly put me at ease as they were able to answer all of my questions and develop a treatment plan that would work best for me. Because of the care I received with my diagnosis, I decided to also get my treatments at Woman’s. I went through several rounds of chemotherapy and radiation that really began to take a toll on me. But the nurses and staff refused to let me give up. They were always there to make sure I was ok, to help make me comfortable and to let me know I wasn’t alone. They let me know that I could do it, and because of them, I am proud to say that I am doing just that – I am beating cancer. For more information about Woman’s GYN cancer care, click here. 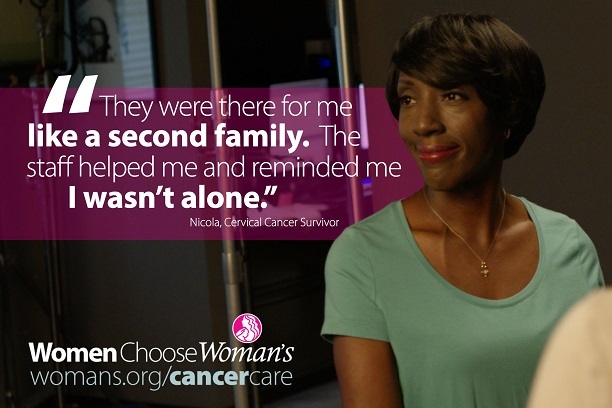 For information about cancer survivorship & support, click here.